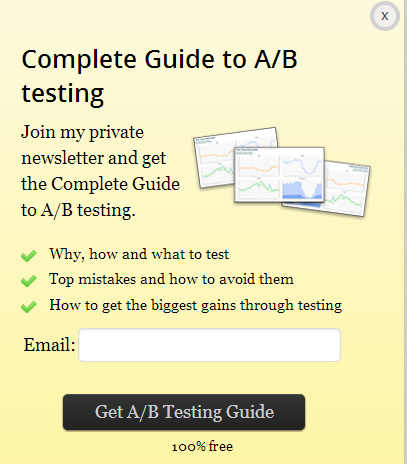 Blog » Conversion » Opt-In Pop-Ups: Are They Any Good? I happened to see the following comment on a case study on how pop-ups impact conversion. These comments may indicate that everyone hates opt-in pop-ups. In fact, you may hate pop-ups. But well-regarded marketers (Neil Patel is one) have indicated they get good results using them. So we have to ask: Is there any substance to all the negativity surrounding pop-ups? Do they really do more harm than good? It’s the ignorance and lack of effort in taking advantage of these options that cause all the complaints. While it’s true that some readers find them annoying, the benefits gained by employing them far outweigh the losses. Indeed, after reading this post you may kick yourself for not using them earlier on your site. 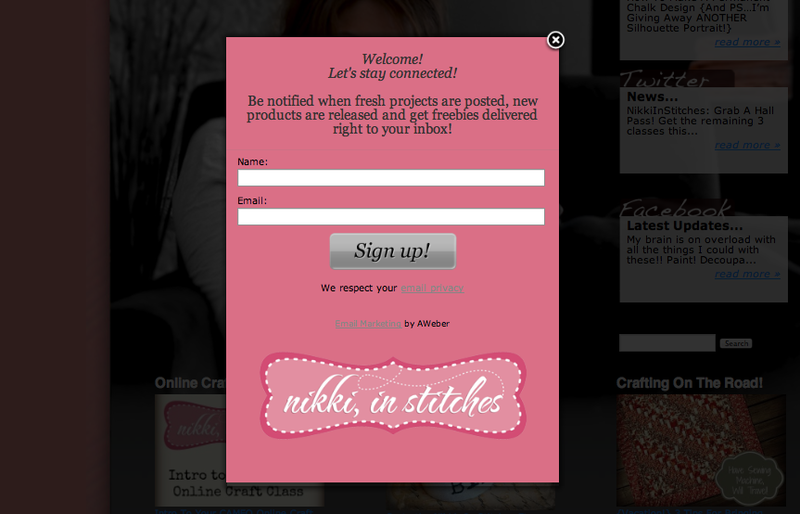 Nikki McGonigal, a food craft blogger, started testing out with both sidebar and light-box forms for opt-ins. After 8 months, when she compared the results, she found that the light-box form drove over 7,000 additional subscribers. The sidebar form had a subscription rate of .4% while the light-box form converted at 5.5%. That is 1,375% more subscribers. The light-box form used was one present by default on AWeber. Of course you can use Aweber’s built-in light-box utility, but to be honest, it looks kind of dumb. Back in 2008, Darren Rowse’s photography blog was averaging 40 subscribers a day. He decided to test the AWeber light-box pop-up on his site. He feared that things as intrusive as a pop-up would alienate his visitors. What happened was quite the opposite. Pages viewed per visitor were up and bounce rates remained almost the same. The site was now amassing 400 new subscribers per day. Ask-Leo.com drove just 10 to 15 subscribers despite getting 44,000 unique visitors every day. Site owner Leo decided to set-up a hover box to show up at a delay of 75 seconds, 60 seconds, 45 seconds, etc. After all the split tests, he found the hover box set at a delay of 60 seconds was capturing the most emails. He was now getting 100 to 150 subscribers on a daily basis. Mama’s Lebanese kitchen, a recipe blog, began implementing opt-in pop-ups back in September 2012. By the end of October, they had gone from 1 subscriber a day to 10 subscribers per day. They used Hybrid Connect for this, and with a few more split-tests, the conversions went even higher. Conversion Voodoo was able to carry out some tests over at the ShoeMoney blog. They discovered that the inline forms disappeared when the user tried to type in the email. Just by dimming the inline field and keeping the words “Enter your email” slightly visible improved the conversions by 36%. What are the different kinds of pop-ups and how do they affect conversions? The simple opt-in pops are ones without many bells and whistles. 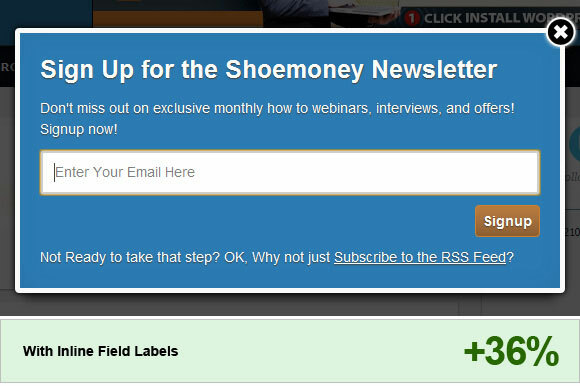 These pop-ups spell out the benefits of subscribing to the blog. Since, it doesn’t offer anything in exchange, only people who are really interested in what you’re sharing would sign up. 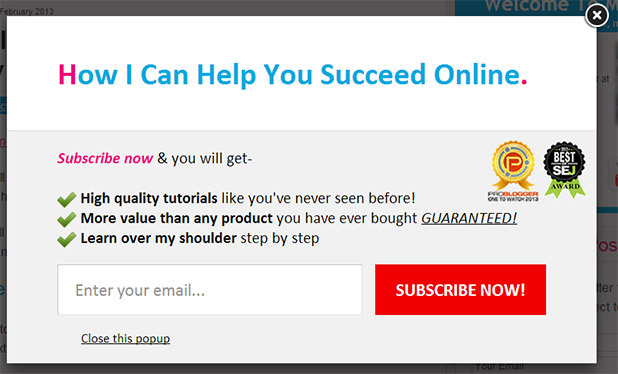 If you’d like a very loyal list of subscribers, you should go for simple opt-in pop-ups. You can see an example below. A free gift like an eBook increases the opt-in rates dramatically. Although it does come at the cost of getting freebie seekers, if you want to grow your email list quickly it’s a good option. This simple pop-up, which doesn’t even directly ask for emails, is the third biggest lead generator on Usertesting.com. And Health Ambition, a site in the food and health niche, got a nice .4% bump in conversions when they offered a free report in exchange for reader email. However, they had some extremely popular blog posts on the topic of juicing. They decided to offer new subscribers a custom juicing related eBook and the opt-in rate jumped to 3.2%. That’s nearly a 3% increase. The scrolling-trigged pop-up is something that I regularly see at ConversionXL. You start reading the post, reach to the end of it and then there’s a pop-up. The trigger time can be adjusted depending on where you want the pop-up to display based on the percentage of text read. It’s a great way to get subscribers. People are already interested in the article and may like to get more. Though the term sounds fancy, the technology behind it is really simple. The plugin tracks users’ mouse movements to get a sense of when they’re about to leave. How it does this really easy. If the visitor’s mouse leaves the page area to go to either the close button or back button it triggers the plugin. Neil Patel tested pop-ups with exit-intent technology for his site NeilPatel.com. He was able to increase conversions by 46%. 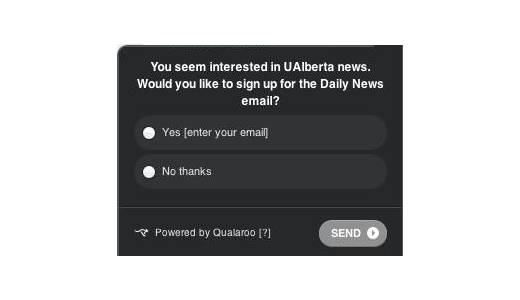 You can see similar exit intent pop-ups on Quick Sprout too. I was just using the free tool over at QuickSprout. The pop-up is powered by Bounce Exchange. It does however cost a hearty $3995 per month for the starter package itself. 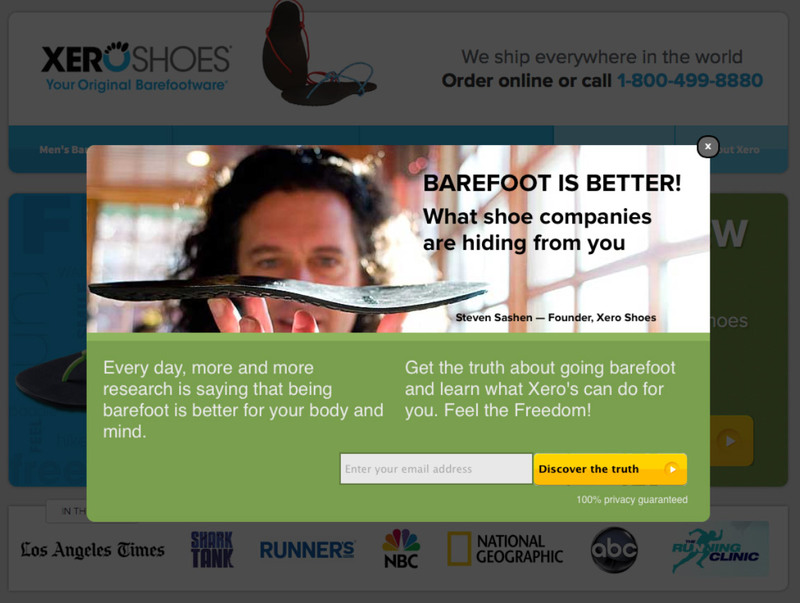 Another example is Xero Shoes, who presents visitors with a free research report when they are about to leave the site. This report on the benefits of going barefoot raised opt-ins by 2.5% and sales by 28.4%. 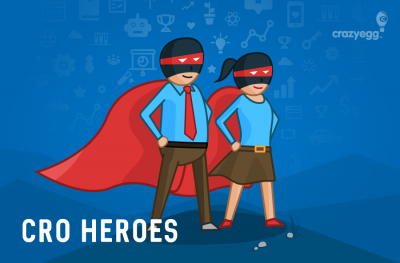 Syed Balkhi of WP-Beginner saw a 600% lift in email opt-ins when he used Optin Monster’s pop-ups powered with exit intent technology. Optin Monster tripled the conversion rates. The bounce rate didn’t go up either. Optin Monster with exit intent technology would cost you $199. It’s much cheaper than Bounce Exchange. However, an even cheaper option is Holdonstranger. You can even see a live demo of your own site (or any site for that matter). I just keyed in mine and pretended to leave the site. BAM we have the pop-up. It costs $97 a year, which works out to $8 per month. See how Kissmetrics employs the arrogant pop-up. Pop-ups with words like “No thanks,” or “I am happy with low traffic” are never supposed to work if you go by common sense. But according to data from ConversionXL, these very opt-in boxes outperformed others by 34%. It’s not an opt-in pop-up in the strictest sense. However it’s similar to scrolling-triggered opt-in pop-ups. Back in September 2011, the guys running the Univeristy of Alberta website found that they were getting lots of visitors from organic search. They wanted to see if anything could be done to make them subscribe. All they did was use Qualroo and casually mention that they noticed the visitor loved news. See what happened during the next 9 months. Granted, three times the visitors weren’t interested in subscribing, but 21% might never have signed up without this extra nudge. A small increase in conversions is always better than none. I’m sure if they had used some of the more aggressive options mentioned above, the success rates would have been higher. Does the timing of pop-ups impact conversions? Let’s talk about how the pop-up timing affects conversions. 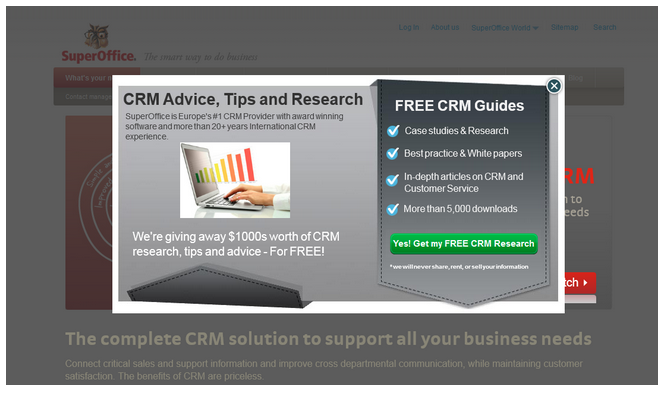 Studies have shown if pop-ups are displayed after 5 seconds, the sign-ups are the highest. Thinking about it, if you slap a pop-up right off the bat, it may annoy people even more. Five seconds seems to be the sweet spot between giving enough time for getting a feel for the site and not appearing too aggressive. However, does waiting a little longer decrease the conversions? 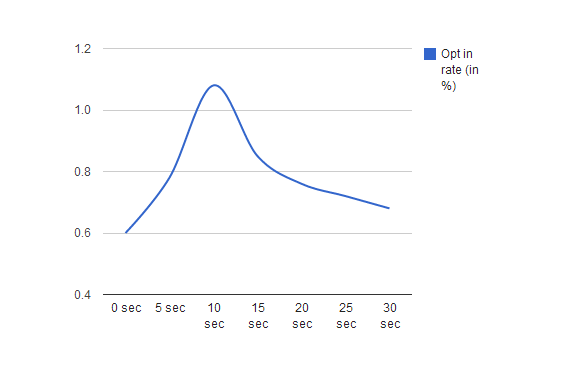 In another experiment, opt-ins peaked at 10 seconds and were comparatively poor at the 5-second mark. It seems that the best timing and conversion rates vary from one site to another. You need to test it out for yourself. Now for a look at bounce rates. All the case studies above show that pop-ups have no impact on the bounce rates. But is it true throughout? Do pop-ups negatively affect the engagement metrics? I searched long and hard to find something that shows if pop-ups can have a negative impact on opt-ins or engagement metrics. We have one case study that shows pop-ups increasing the bounce rate. Matthew Woodward ran the tests for time periods of 50 days each. 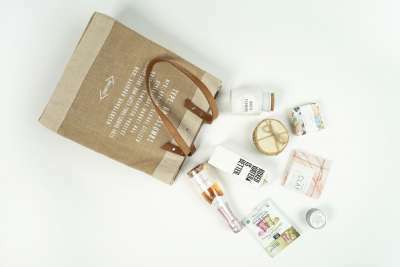 The former 50-day period featured no pop-up and the later period featured a pop-up. He used a 7-second delay to display them. While the conversion soared to 40%, the bounce rate increased by 9.02%, the average visitor duration declined by 10% and pages per visit too decreased by 9%. The bounce rate for the returning visitors or the regular readers didn’t increase much. However compared to the opt-in forms displayed at the end of the post, in the sidebar, or on the About Us page, the pop-up was the one most successful in converting visitors. I reached out to Matthew to see if the statistics were unchanged even now, and he confirmed that they are. I feel that there are a couple of things that can help boost engagement metrics. The 7-second delay may be too soon for the readers. The timing is a good thing to test. Mobile visitors were spared the pop-up. However I’d encourage displaying pop-ups to them since the plugin used is mobile compatible. Also, even if it’s unrelated research, if mobile visitors can fill in surveys they might as well key in their email ids too. The table shows survey responses and a large percentage came from smartphones and tablets, so it’s clear they will respond. The third possibility is that the lack of an opt-in bribe. Readers are less reluctant to give away their email ids for nothing, so much so that they’d rather close the page. Even if you hate them, please let us know why you think that they won’t work for you. Have you tested out pop-ups and found that they lower engagement and decrease overall conversions? We are dying to know about any such test results. Please share them via comments below.